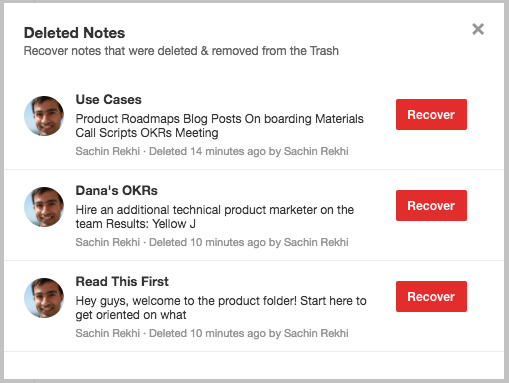 Today we launched the ability to recover notes that have been deleted and removed from the Trash to help ensure you never lose any of your team's valuable information. You'll see a recover deleted notes link at the bottom of the Trash that will bring up this dialog. Then click on recover next to any note and it'll move it back to the Trash. From there you can drag it to whichever notebook you like. You'll be able to see all notes that were deleted from libraries you are an admin of in the dialog. If you're trying to recover a note in a library you aren't an admin in, please contact your admin to assist you. Recover deleted notes plus our recently launched enhanced Trash ensures you can never lose your team's most valuable information. To take advantage of this, upgrade now to Notejoy Plus or Notejoy Premium. Learn more about our paid plans at Plans & Pricing.